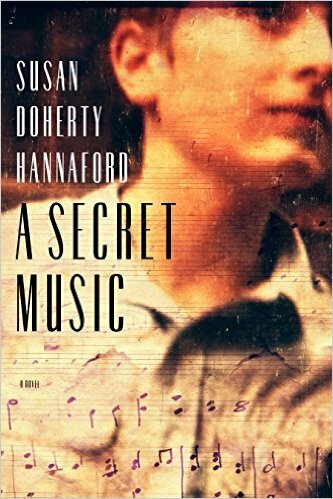 These two sentences, which open Susan Doherty Hannaford’s award-winning novel A Secret Music, takes the reader on a journey with Lawrence as he tries to cope with the pressures of music competitions while staying silent about his personal circumstances. A Secret Music, transports the reader to a Depression-era Montreal complete with its ethnic and linguistic enclaves. The book introduces use to Lawrence, a child prodigy, whose music-teacher mother honed his natural gifts. Two key factors see Lawrence introduced to other teachers and, eventually, a prestigious music school. The first, and primary one, is his mother’s illness which, today, would be diagnosed as post-partum depression but is called, at the time, “flattened anxiety.” The second is her recognition her recognition that Lawrence’s talent exceeds her ability to continue to teach him. For Lawrence, though, the music becomes the doorway to his mother’s attention as she battles with mental illness, often staying in bed for days at a time, neglecting Lawrence and his brother and sister. Other times, music becomes the only solace he has in a private world that seems to be falling apart. Beautifully written, A Secret Music, transports the reader to a Depression-era Montreal complete with its ethnic and linguistic enclaves. The reader can become invested and involved so deeply in the lives of the characters that when a tragedy hits the Nolan family, the reader will feel just as devastated. A Secret Music was this year’s winner of Grace Irwin Prize—Canada’s largest literary prize for writers who are Christian – an honour it more than deserves. The book’s intricate plot, more-than-realistic characters and timely message of a better understanding for mental illness will make it a classic.